Yes, so you could probably just buy a whole bunch of house of plants, and actually, that may be the easier way to go but... the Andrea Living Air Filter is currently on sale at A+R, and whether it's a gift or simply for yourself this device is worth having, simply even for the originality of this cool home machination. Transform any house plant into a super toxic avenger! 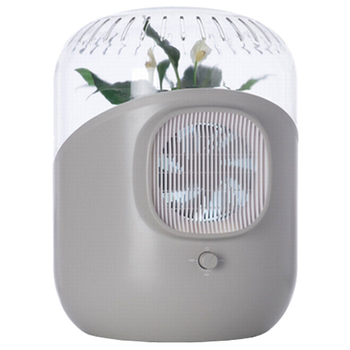 Andrea is the first living air filter that uses plants to absorb toxic gases via low-power consumption, ozone-free operation. Independent third party testing by RTP Labs certified Andrea is 40 times more efficient than standard carbon and HEPA filters (aka High Efficiency Particulate Air) in removing volatile toxins such as formaldehyde (a known human carcinogen used in floor coverings) and benzene and ammonia (found in many home-use cleaning solutions). RTP found that interior plants alone are more efficient than HEPA and carbon filters at removing toxic gases from air--but significantly less efficient than Andrea, which it determined is over 1000% FASTER THAN PLANTS ALONE. 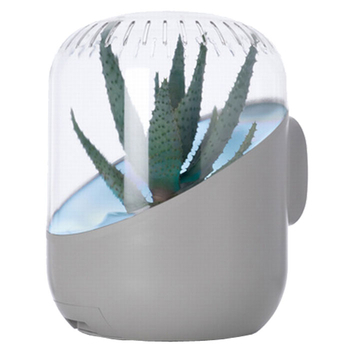 A plant’s natural metabolic activity eliminates pollution, boosted by Andrea's whisper-quiet fan that propels it through the leaves and root system, out through the water and soil filtration and back into the room environment. Andrea can be turned on and off through the day. No replaceable filters needed. Plants are not included but any household plant will do but those will best filtering abilities are philodendron gerbera, spathiphyllum, chlorophytum and pathos. One big house plant should do the trick!